Catherine “Gravity” Vasily V. Kandinsky wrote in 1935. On a dark background, the artist depicted a composition of clear lines, circles and squares. The center of the canvas, he marked a kind of axis from one horizontal line and several vertical ones. In the upper left corner of the canvas, he placed a square, marked up on many small squares of different colors, combining shades of a palette of brown, pink, red, gray and black. Slightly lower, on the same side of the picture on the axis, he built a circle, and the intersection of the horizontal and vertical lines divide it into four spectra: blue, red and two shades of orange. In the center, another circle is drawn, which has two colors: the main one is pale lilac, and at the core is a black circle. It is located in the lower part of the canvas so that its top is crossed by axial lines, and the left part is superimposed on the red spectrum of the small circle. On the left side, seven rectangles of different sizes and colors are drawn on it: blue, pink, red and black. The largest part of the rectangle of red color is slightly superimposed on its lower part. On the other side of the vertical line of the rectangles is a large square, divided into small squares of blue, blue, red, yellow, pink, purple, brown and black. Above this square, at the intersection of the centerlines, there is another circle consisting of two parts of different tones of green. In the center, above the large circle, the artist depicted the intersection of four oval lines of red, pink and black. 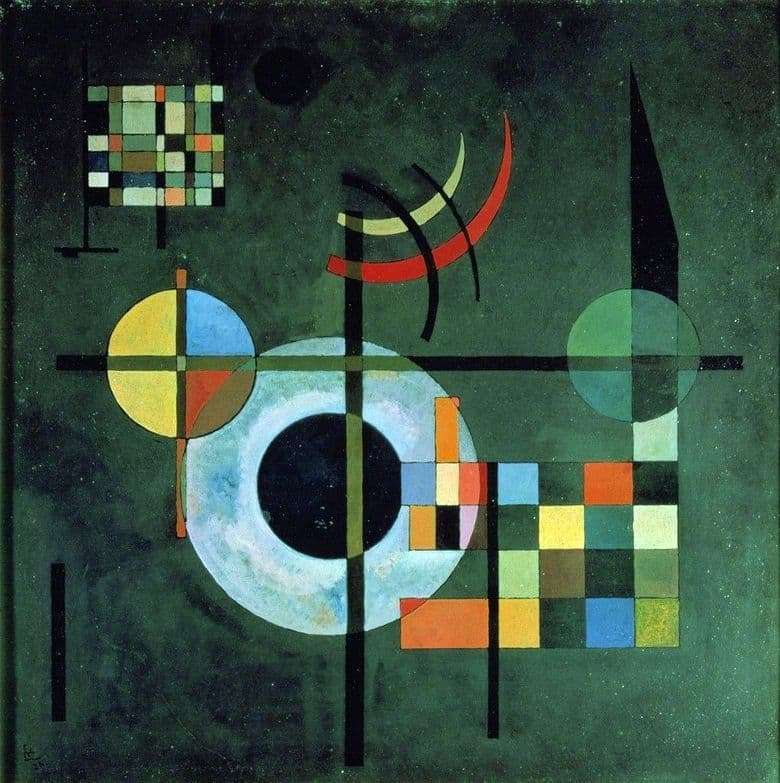 The whole composition is fully consistent with Kandinsky’s color theory that each color has its own dynamic characteristic.